This month marks the 80 year anniversary for Brides Magazine. First of all, hats off to you, folks. 80 years bringing brides inspiration is nothing to laugh about. That's just down right impressive. 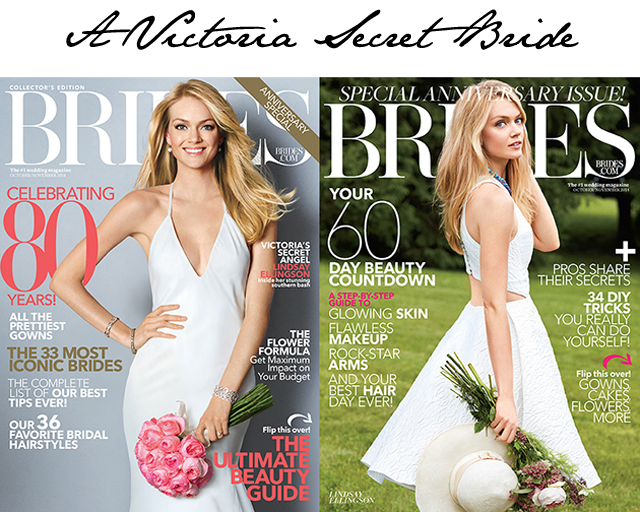 To celebrate the anniversary, Brides feature Victoria's Secret model Lindsay Ellingson on their cover for the October/November issue. Lindsay is seen wearing two dresses for the covers - a long traditional Vera Wang gown and a short, funkier dress from Angel Sanchez. Oh, and let's not forget about the Monique L'huillier Jumpsuit moment. Then there's a whole feature on Lindsay Ellingson's recent real wedding in South Carolina. In short, it's an issue worth a glance.